Content blocking is a new system level feature in iOS 9. 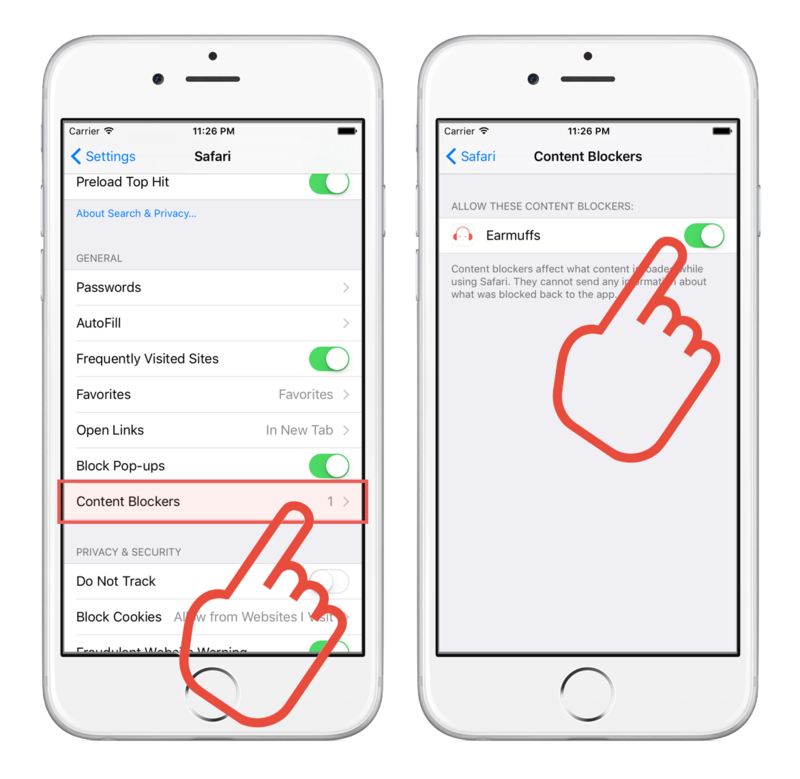 Content blockers works directly with the Safari browser, but need to be enabled before they can be used. 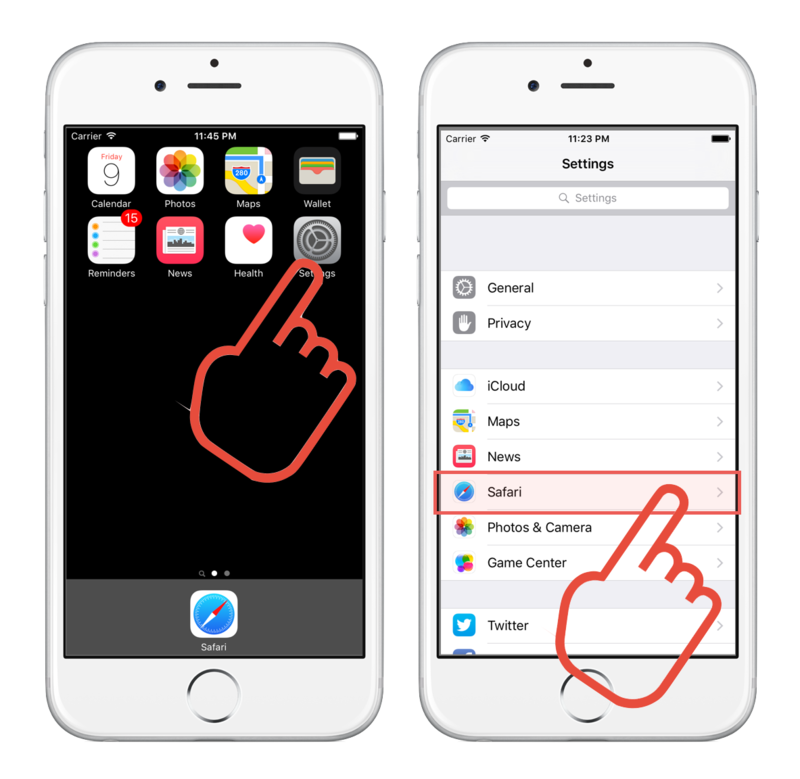 Navigate to your device's Settings app. The Settings app icon shows an arrangement of gray gears. Tap on "Safari" in the settings list. Tap on "Content" Blockers inside Safair settings. Enable Earmuffs by toggling the switch to "On". The green background on the switch indicates that it is on. Safari content blockers are not exclusive. You can use mutliple content blockers at the same time. When a content blocker is working, Safari will not load the site. You will see a blank page in the Safari browser. In the example, we are using the blacklist to block websites with the term "cats" in the site name. In the top screenshot, the search term "cats" shows images and sites of cats from a standard web search. 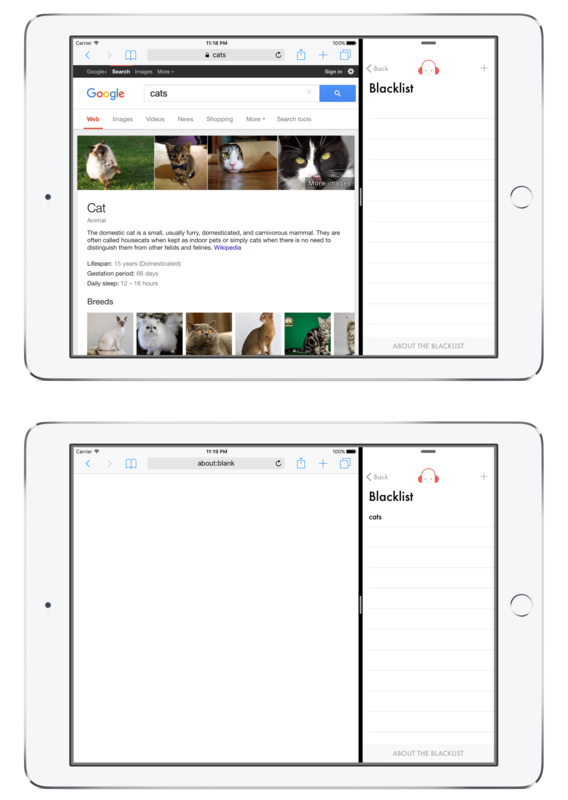 Once the term "cats" is added to the block list, Safari only page shows a blank screen. Every family is different and only they can decide what content is appropriate for their household. You can customize Earmuffs to match your family's values through the use of a whitelist and blacklist. Navigate to the appropriate list and tap the "+". Enter a term you either wish to block or allow. You should try to be as specific as possible when adding or blocking terms. You may accidently allow or block sites that you did not intend. For best results, do not enter any blank spaces or punctuation in your terms. The term will automatically be loaded into the blocker. You may edit both lists by swiping across the table cells to delete a term. 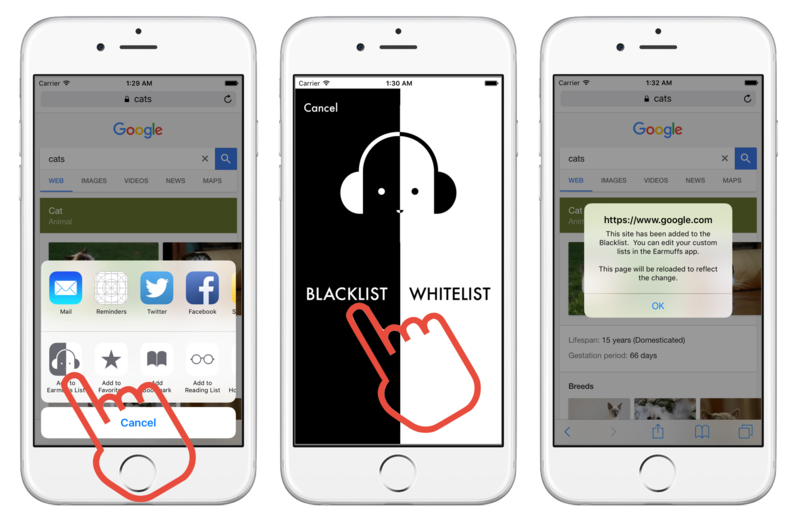 The simplest way to add a site to either the white or black list is through the Earmuffs Safari action extension. Once enabled, you can add sites directly while browsing Safari. In Safari, tap the share icon (square with arrow pointing up). By default, the Earmuffs extension will not be enabled. Tap the "More" button to enable it. Identify the "Add to Earmuffs List" and toggle the switch to "On". The switch is "On" when the background is green. You may rearrange the order that the icons appear in the extension by reodering the table. 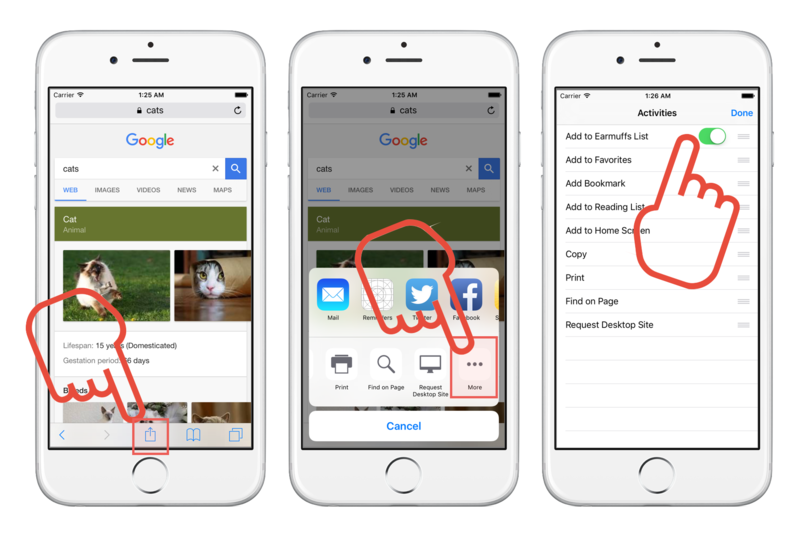 While browsing in Safari, when you come across a site you want to add to a list, tap the share icon (square with arrow pointing up). Tap the "Add to Earmuffs" icon. Tap either "Blacklist" or "Whitelist". The site will be added to the appropriate list and the page will be reloaded to reflect your selection. 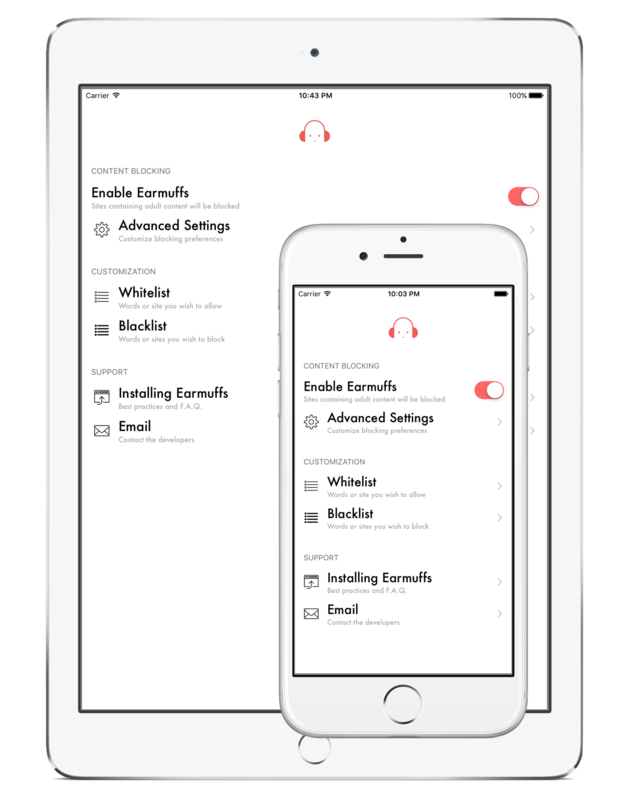 Remember that you can edit both lists directly from the Earmuffs application.